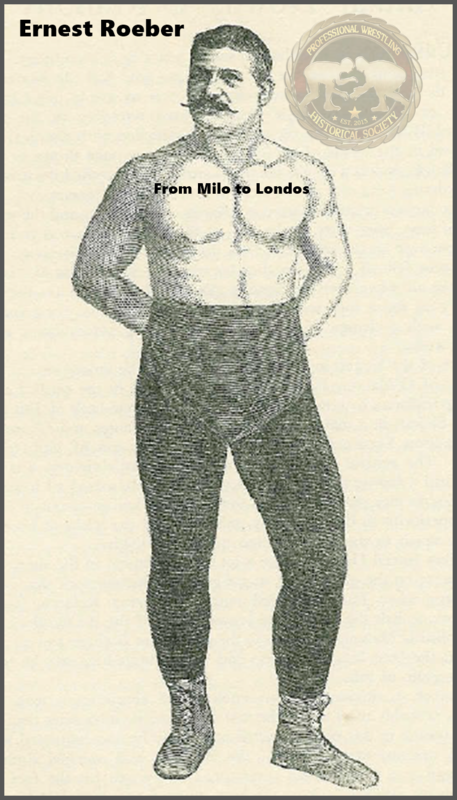 A German born wrestler, who actually wrestled in America before he ever did in his home country, although his American upbringing was not always acknowledged. He was born on September 18, 1862 and his parents came to America when he was just a child in 1866. He was raised in the Bowery district of New York. At the tender age of 18 he joined an athletic club. He excelled as an amateur wrestler, winning awards, the first believed to be on September 4, 1883 for a gold medal worth $50. Graeco-Roman was his chosen form of wrestling, still ranked as the most popular style while he was growing up. By the time he broke into the professional side of things in the late 1880s that had changed, and Catch-as-Catch-Can was officially king. Not that, that mattered to Roeber as he was determined to succeed at the style he loved. He worked his way up through the ranks trading wins with Sebastian Miller AKA Mueller and held the Japanese sensation Sorakichi Matsuda to a draw on more than one occasion over the next few years. He started to receive a lot of attention when he defeated Professor William Hoeffier on December 22, 1888. The match was billed as for the New York State Graeco-Roman Wrestling Championship. Then on November 11, 1889 he managed to hold his own with William Muldoon in an open challenge, after being convinced by a local gang to accept it. Muldoon was so taken aback by the newcomers abilities he immediately took him on the road with him as part of his troupe. At the time Muldoon was still the reigning American Greco-Roman Champion. The two would tour together for the next couple of years and over the course of that time Muldoon would announce Roeber as the true champion in February 9, 1891. Through-out 1892 Roeber took on and defeated various foreign champions. Starting with Auguste Robinet on April 12, a French Champion, then Louis Lawrence on May 31, a German Champion, and another French Champion on June 25 in Apollon. Many people had grumbled over Muldoon just handing the title over, but those three matches went a long way in proving that he was a true World Champion as he claimed, well, proving it in the American public's eyes anyway. At the very beginning of 1893, January 13 to be exact, Roeber was listed as the top Graeco-Roman wrestler in America according to certain newspapers. From there the build to a match that was supposed to be iconic was started. It was for the American Mixed Styles Championship and it would pit Roeber, still the Graeco-Roman Champion against the Catch-as-Catch-Can Championship, Evan Lewis. They came together on March 3 in New Orleans, Louisiana. The match was a devastating let down drawing only 3,000 people of an expected 10,000. Most of the year after that was spent touring the various theaters and taking an "All comers," for the majority the shows were still being put on by William Muldoon, with the two occasionally giving an exhibition. His biggest match of 1894 was against Duncan C. Ross. Roeber came out on top in three straight falls on June 11. Shortly after in July Roeber left America for a tour of Europe, word of his arrival was received back in New York on August 10. During January 1895 it is claimed by Roeber that he was awarded the European Graeco-Roman Championship. He had defeated Carl Abs back in September and the two were scheduled for a rematch, but Abs came down with an illness and died shortly thereafter, so Roeber was simply presented with a sheepskin scroll emblematic of the title. He arrived back in America during August. While he was gone one newspaper caused some confusion for historians stating Roeber got knocked out in the eighth round of a boxing match against Tom Lansing, it turned out to be Roeber's brother Fred though. From there his career took a turn very similar to his mentor's. Although Roeber did continue to wrestle sporadically, he spent a lot of his time with the boxing legend, Bob Fitzsimmons, they shared the same manager in Martin Julian. By the middle of 1896 it had been announced officially that Roeber and Fitzsimmons were training together. The primary purpose was for Roeber to teach Fitzsimmons some wrestling and help with his endurance, rather than for the wrestler to learn boxing, he obviously picked up a lot of knowledge from Fitzsimmons though. On February 18, 1897 they staged a Graeco-Roman exhibition in front of a large crowd in Salt Lake City. Of course all of that was in preparation for Bob Fitzsimmons's big fight against James J, Corbett in Carson, Nevada. Fitzsimmons won, all the hours he had spent with Roeber and his other trainers had clearly paid off. There's no doubt that Fitzsimmons accredited much of his ability in that match to all the hours Roeber put in with him. They remained years for many friends even after Roeber had a falling out with Martin Julian over money relating to this period of time. After the win Roeber continued to tour with Fitzsimmons across the country staging wrestling and boxing exhibitions. They did not always pair off against each other though, sometimes they'd take part in different roles on the shows. In the summer of 1897, Roeber even tried promoting his own show with Dan Hickey, who had also been a trainer for Fitzsimmons, no attendance was listed though. All that time Roeber was still listed as the champion and he continued with the Fitzsimmons troupe right into 1898. It must have almost seemed like Roeber was going to continue playing second fiddle to the boxing champion forever. Then in March word got out that Roeber had signed to face his biggest, literally, opponent to date. He was to face the "original Terrible Turk," Yousouff Ishmaelo (Koca Yusuf). Up to 15,000 people were crammed into Madison Square Garden to watch the match on March 26, 1898. Fitzsimmons was in Roeber's corner. The contest itself was received very differently depending which newspaper you picked up. It was either a fiasco with the fix in, or it was a vicious attack by the Turk upon Roeber. Either way Roeber won by disqualification when he was either pushed off of, or fell off of due to clumsiness while running away from the Turk on, the stage. They met again on April 30 in the Metropolitan Opera House this time ending with the match being thrown out when the Turk was again accused of fouling Roeber and a riot almost broke out. In my humble opinion those two matches really show how the entertainment side of wrestling was being taken to another level and between the four men; the Turk, his manager William Brady, Ernest Roeber, and Martin Julian, they started a trend that stood the test of time. Now, like most stuff this is all highly debated and some believe it was on the level, whether it was or was not, before this match the foreign stars coming over were treated as scientific wrestlers and good at their sports, with Ishmaelo, he was billed as a monster and behaved like one in the ring, especially on the two aforementioned nights and thus the monster, foreign, heel was born in American wrestling. Roeber entered into a feud with Professor James Atlas that took them across the country in the second half of 1898. While offering to take on all comers, Atlas challenged from the audience and they repeated this all over the country and into 1899. There just did not seem to be that much competition out there for him and he continued to toil away touring. Often competing with his pupil, Leo Pardello. In an attempt to do something different, Roeber aligned himself with the Crane Brothers traveling circus show and they toured the country from the early spring on. Normally Roeber was billed as the top act. In December of the same year he had a boxing exhibition with James J. Jeffries, another boxing champion and he would sign up to train him, as he had done Fitzsimmons. The manly art of wrestling is going to regain its old time popularity in the near future. I am convinced that during the coming year much of the enthusiasm over wrestling bouts that used to be witnessed in days gone by will be seen again. I have several reasons for this opinion, one being that much larger crowds of people that have paid to see wrestling contests and exhibitions during the past few months than for several years previous to that time. Only a short time ago I was challenged by Professor Atlas of New York, and the affair was arranged to take place in a hall in a rather out of the way part of that city. I thought possibly a couple of hundred dollars would be taken at the door, but to my great amazement we cleared over $1,100 that night. Little straws like this show which way the wind is blowing, and I am perfectly convinced that it is at last veering round in favor of wrestling, and I hope it is, for it will be a good thing for the youth of this great country if they will go in for wrestling more generally. It is one of the best possible exercises a man can take up, as it not only serves to develop every muscle of the body, but also induces quick thought and rapid action, besides making one able to grasp a sudden opportunity without fatal delay. Still another reason for my opinion that wrestling is coming to the fore is the number of challenges I have been inundated with, directly and indirectly, during the past few weeks. Some of these have been from men who have issued defis simply for the sake of a little possible notoriety. To them, of course, I shall pay not the slightest bit of attention, as they have no intention of ever facing me on the mat. Others, again, have come to me from ambitious, amateurs who think that because they have downed a few local celebrities they must of necessity be world beaters. I cannot afford to pay any attention to this class until they have done some work that necessitates my meeting them, not only because the matches would draw no crowd, but the result would be so farcical, that the old cry of fake, that has already done so much to hurt the game, would inevitably be raised again. I have never been guilty of trying to hoax the public and will not be a party to any scheme that, even if perfectly legitimate, looks like a skin game. There are others who have challenged me, however, whom I shall be only too glad to meet. These are men who are champions in their own countries and who are coming to America to try and wrest the title of champion of the world from me. Among the foreigners who have signified their intention to come over and wrestle me this winter are two men who are likely to give me a good tussle before I down them, for they are fellows with splendid reputations abroad and there are few tricks in connection with the game that they do not know. One of these men is Paul Pons, the champion Graeco-Roman wrestler of France. He is about 6 feet 5 inches in height and built in proportion, with a tremendous muscular development. He has defeated all aspirants in Gaul so handily that now everybody over there is afraid to meet him. A similar complaint as regards a lack of opponents is said to be the reason that Beck Olsen, the champion of Germany, has decided to come over here to get on a match with me. He is another giant in stature, being considerable over 6 feet in height, while I am but 5 feet 7.5 inches. Olsen is commonly known in Europe as the Great Dane, because Denmark is his native land. He is said to have defeated all adversaries with such amazing ease that his countrymen believe him invincible. Naturally, I am confident of defeating him and shall do my best to keep the championship of the world in this country a few years longer. I have twice made tours of Europe, wrestling anyone who would meet me and in 1896 I brought hom with me a sheepskin emblematic of the championship of Europe. While there I met and defeated 100 men in 11 months, often meeting four and five men in one evening. The wrestlers over there are not to be sneezed at, for they are good men, but we have better over here. During the past two or three years there has been an invasion of this country by several alleged Turkish wrestlers, each of whom has claimed to be the champion of the Ottoman empire, and each of whom has in turn declared that he has defeated all comers, including the ones who were here before him. Now, as a matter of fact, none of these men was a wrestler according to our standards. They were simply very strong men who endeavored to win by first hurting or crippling their opponents by breaking their bones. Now that is all wrong and does the sport no good. I want to win by square out and out wrestling, and not the foul means such as the employed. The first time I met one of these Turks he tried to fire me bodily over the ropes and did throw me out of the ring. The second time I met him I was on to his little game, and so he couldn't repeat the trick. Instead he tried to hurt me by throwing me against a post, and I consequently won on a foul. In conclusion let me state that I am willing to defend my title of champion Greco-Roman wrestler of the world against any reputable opponent provided he puts up the proper forfeits and stake money and gives me six weeks to get into condition. I wrestle at 180 pounds weight and require at least that time to get into shape. He faced Magnus Bech-Olsen on March 21, 1900 in a bout for the World Graeco-Roman Championship in front of almost 8,000 fans. 6 months later in September 1900, Roeber regained the title from Bech-Olsen in Copenhagen Denmark. Well, that is what Roeber told the American press, anyway. It wasn't exactly the whole truth. Not even close according to other press outside of America. Roeber went on to have a few more big matches, one against Paul Pons and also against Tom Jenkins and Martin "Farmer" Burns. On November 22, 1901 Roeber was retired. He'd wrestle occasionally and also served as a trainer for both Fitzsimmons and Jeffries again, but for all intents and purposes his career was over. He had already started training wrestlers, many of whom went on to amateur fame. Going forward he concentrated on that and his business ventures such as his saloon in Manhattan and cafe in Ridgewood, New York and appearances as a referee until he passed away on December 21, 1944, almost everywhere lists his date of death as April 30, 1944, I have no idea why that is. Roeber was not the most popular man in wrestling, nor by accounts did he put on the best matches, but, he showed how more showmanship than there already was could be added into wrestling, He helped keep a style of wrestling that was already on deaths door relevant for a whole decade. The fact he could start his own businesses show he had made enough money in wrestling, so even though attendances don't always seem to reflect it, he certainly wasn't earning spare change either. When you take his big matches, then you throw in the work he did training both Fitzsimmons and Jeffries, and helping to popularize boxer versus wrestler matches, and also that he was one of the first wrestlers used for motion pictures, being featured in a handful of films created by the Edison company and it's associates, there's no way Roeber can not be considered one of the key names in American 19th century wrestling.